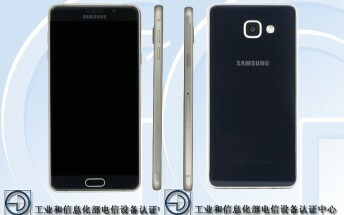 The second generation Samsung Galaxy A7 has been certified by the FCC, after having already received the go-ahead from the Bluetooth SIG as well as China's TENAA. The successor to the original Galaxy A7 from earlier this year has been leaking a lot lately, along with other members of the new A family. We've seen the A7 in live images and it's been spotted in a benchmark database too. 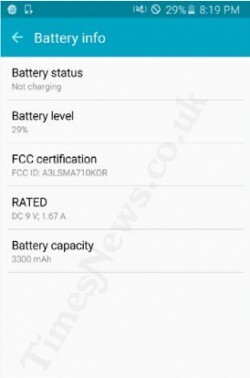 The FCC certification thankfully reveals that the new Galaxy A7 (2016) will have a 3,300 mAh battery, which is way bigger than the original A7's 2,600 mAh cell. This means the new model should hopefully last more on a charge. The FCC says the A7 (2016) is 151.8mm long and 74.5mm wide, which means it's narrower than its 76.2mm predecessor. The new phone has 4G, Bluetooth, Wi-Fi, and GPS, as you'd expect. While the FCC documents haven't outed any more specs, the TENAA certification from a few days ago basically gave us the full picture. The Galaxy A7 (2016) will have a 5.5-inch 1080p AMOLED touchscreen, a 13 MP rear camera, a 5 MP selfie snapper, 3GB of RAM, and a 1.7 GHz octa-core processor. It will run Android 5.1 Lollipop. Given all the times it's been in the news recently, we assume the new Galaxy A7 will become official pretty soon.